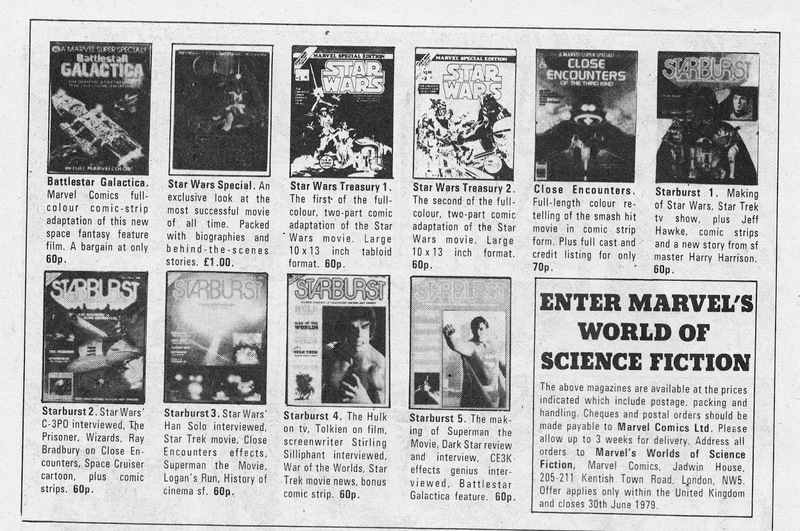 Sticking with June 1979, here's a half-page UK House Ad plugging MARVEL'S WORLDS OF SCIENCE FICTION, basically STARBURST and a host of one-shots, based on media properties, published by Marvel on both sides of the Atlantic during the SF boom years of the late seventies. How many do you have? The BATTLESTAR GALACTICA SUPER SPECIAL received next to no promotion in the UK line, despite copies being imported into the UK. As I've posted in the past, Marvel promoted the hell out of the CLOSE ENCOUNTERS OF THE THIRD KIND one-shot in the UK weeklies but virtually ignored the Galactica, even when the movie edit was released in cinemas in 1979. Marvel UK didn't even bother with a British outing for the movie/ pilot adaptation, the first British reprints (in STAR HEROES WINTER SPECIAL 1979) picked-up with issues 4 and 5 of the US monthly. Except for imported copies, the first sight British readers had of the extended three-part adaptation of Saga of a Star World was when Titan Books issued a trade paperback, of the same name, to coincide with the new series. That's a long time to wait. The two STAR WARS TREASURY EDITIONS was another US reprint of the six-part, split herein into two equal chunks, adaptation of the movie. As I've noted in previous posts, they actually crossed the Atlantic in late 1977 giving British readers an early taste of the movie (STAR WARS WEEKLY didn't launch until February 1978).